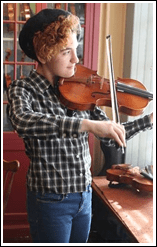 Basic Viola Rental – beginner viola with ebony fittings, a pleasing sound, wood bow, and light backpack case. $25 per month includes a $16 rental fee, a $5.80 protection fee, and a $3.20 administrative fee. You may use 100% of your rental fee towards eventual purchase of an instrument. Charges are billed every three months. We require a deposit of $125, which will be returned when you decide to terminate your rental or buy your instrument, as long as your instrument has been well maintained. To begin your rental you pay $206.00 (including tax). Our rentals include everything you need to play: bow, case, rosin and music stand. Your next bill of $81.00 (including tax) will automatically be deducted three months later. Mid-level Viola Rental – step-up viola with a dark orange varnish, nice grain, ebony fittings, a bolder, more projecting sound, wood bow & light backpack case. $36.80 per month includes a $24.00 rental fee and a $8 protection fee, a $4.80 administrative fee. You may use 100% of your rental fee towards eventual purchase of an instrument. Charges are billed every three months. We require a deposit of $150, which will be returned when you decide to terminate your rental or buy your instrument, as long as your instrument has been well maintained. To begin your rental you’ll pay $269.23 (including tax). Our rentals include everything you need to play: bow, case, rosin and music stand. Your next bill of $119.23 will automatically be deducted three months later. Advanced Viola Rental – advanced viola with a beautiful golden varnish, lightly flamed maple back, ebony fittings, warm, full sound, Carbon fiber bow and oblong case. $58 per month includes a $40.00 rental fee, a $10.00 protection fee, and an $8.00 administrative fee. You may use 100% of your rental fee towards eventual purchase of an instrument. Charges are billed monthly. When you sign up you are billed for the first three months. We require a deposit of $200, which will be returned when you decide to terminate your rental or buy your instrument, as long as your instrument has been well maintained. To begin your rental you’ll pay $387.92 (including tax). Our rentals include everything you need to play: bow, case, rosin and music stand. Your next bill of $62.64 will automatically be deducted three months later and then monthly.